Per Kirkeby’s painting Fram appears to be completely abstract but actually has a story behind it. Kirkeby has said that when he is working on a painting, he often goes to his art library, looks at an art history book and takes it to his studio. “I borrow something, something starts to move. That’s the way I use my art history.” In this case, Fram, which means “forward,” was a ship built by Norwegian polar explorer Fridtjof Nansens and used for his 1893 voyage to the North Pole. The ship was considered to be the strongest wooden ship ever built. Kirkeby, who initially studied arctic geology at the University of Copenhagen, has said that he has always been fascinated by polar expeditions. (Left) Kirkeby, Fram (detail), 1982. (Right) Willem Claesz. Heda. Stilleven met een zilveren tazza, 1630. Rijksmuseum, Amsterdam. Some of Fram‘s composition is based on Sea of Ice by Caspar David Friedrich, which features a wrecked ship amidst a forbidding display of shards of ice in the polar sea. As Kirkeby stated, “The story fascinated me. It is both an ice floe and a tabletop. It’s very audacious to reach the North Pole by subjecting a ship to these audacious forces.” In Kirkeby’s painting, the energetic brushstrokes on the left pay homage to Friedrich’s composition, while the fallen tumbler on the right refers to a 17th-century Dutch still life by Willem Claeszoon Heda. 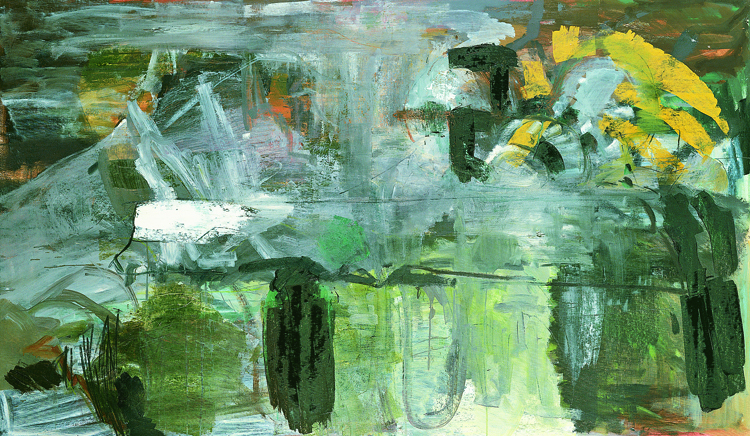 Kirkeby combined landscape and still life, genres that seemed outdated in 1983 when he painted Fram, into a new, hybrid composition, perhaps reflecting the drive for knowledge that inspired Fram’s journey. This entry was posted in Exhibitions and tagged Casper David Friedrich, explorers, Per Kirkeby, ships. Bookmark the permalink.